Families who lost loved ones on September 11 are angry over the news that the Obama Administration has intervened to prevent alleged Saudi terror financiers from lawsuits. On May 29 - just five days before President Obama made his first state visit to Saudi Arabia - Solicitor General Elena Kagan filed a brief arguing that it would be "unwarranted" for the Supreme Court to hear cases brought by the families against five of Saudi King Abdullah's closest relatives for financing the attacks. The group, named the 9/11 Families United to Bankrupt Terrorism, charges that "five Saudi princes knowingly and intentionally provided financial support to al Qaeda waging war on America." 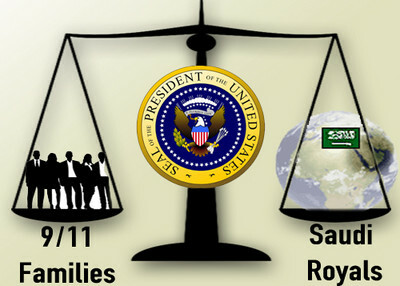 "By urging the high court to not review lower court decisions dismissing these these cases, the Obama Administration took the side of the Saudi princes over thousands of family members and survivors of the 9/ll attacks seeking justice and accountability in U.S. courts," the families said in a statement issued May 29. "The Administration's filing mocks our system of justice and strikes a blow against the public's right to know the facts about who financed and supported the murder of 3,000 innocent people. It undermines our fight against terrorism and suggests a green light to terrorist sympathizers the world over that they can send money to al Qaeda without having to worry that they will be held accountable in the U.S. Courts for the atrocities that result." Mike Low of Batesville, Ark., lost his daughter Sara on September 11. She was an American Airlines flight attendant who died on Flight 11, which slammed into the North Tower of the World Trade Center. Low called the administration's decision to urge the Supreme Court not to hear the case "a betrayal of our fundamentally American right to have our day in court." The move "sacrifices the principles of justice" in order to accommodate the political pleadings of a foreign government on behalf of a handful of members of its monarchy," he said. *Prince Turki Al-Faisal Al-Saud, "past head of Saudi intelligence, coordinated Saudi financial and logistical support for al Qaeda, Osama bin Laden and the Taliban. In July 1998, Prince Turki brokered an agreement between these parties in which the Saudis provided al Qaeda the Taliban with generous financial assistance in exchange for a pledge by bin Laden and the Taliban that al Qaeda would not attack the Saudi royal family." *Prince Salman Bin-Abdulaziz Al-Saud "has a long history of funding Islamic extremists through his work as chairman of the General Donation Committee for Afghanistan. In this capacity, Prince Salman made substantial personal contributions to al Qaeda front charities with the full knowledge the charities were misappropriating funds and involved in terrorist activities." *Prince Naif Bin-Abdulaziz Al-Saud, "who has long supported Palestinian suicide bombers, provided pay-off money to al Qaeda. His oversight of al Qaeda charity al Haramain allowed it to support bin Laden and al Qaeda unabated." *Prince Mohamed Al-Faisal Al-Saud "headed the Islamic bank Dar al Maal al Islami, which provided global financial services and financing to al Qaeda and Osama bin Laden." *Prince Sultan Bin-Abdulaziz Al-Saud, "whose responsibilities included overseeing Islamic charitable funding in Saudi Arabia, funded al Qaeda through personal contributions to Islamic charities known to support bin Laden and his terrorist organization. In her brief arguing that the Supreme Court should not hear the case, the solicitor general argues that U.S. courts cannot exercise personal jurisdiction over the Saudi princes who gave money to al Qaeda because they were not "primary wrongdoers," having only engaged in "indirect funding of al Qaeda." The families counter that this conflicts with a December 3, 2008 ruling by the United States Court of Appeals for the Seventh Circuit in Boim v. Holy Land Foundation, which upheld a $156 million judgment against several Palestinian charities accused of funding Hamas. The court ruled that all persons who donate money to known terrorist groups are themselves engaging in terrorism and should therefore be considered "primary violators" subject to "primary liability" under U.S. law. "Nor should donors to terrorism be able to escape liability because terrorists and their supporters launder money through a chain of intermediate organizations. Donor A gives to innocent appearing organization B which gives to innocent-appearing organization C which gives to Hamas. As long as A either knows or is reckless in failing to discover that donations to B end up with Hamas, A is liable." The Obama Administration's decision to side with Saudi Arabia isn't the first time the government sided with foreign governments against Americans seeking to collect terror-related judgments. Stephen Flatow, an attorney in West Orange, N.J. has had more than 14 years experience fighting the government to collect on court judgments against terror-sponsoring foreign nations. On April 9, 1995, his 20-year-old daughter Alisa was murdered by a Palestinian Islamic Jihad suicide bomber in Gaza. The Flatow family sued the Iranian government under a 1996 federal law authorizing lawsuits for damages suffered in acts of terrorism, ultimately winning a $247.5 million verdict against the Iranian government. When the family tried to collect, however, it ran into a buzzsaw of opposition from the Clinton Administration, which was worried that forcing Iran to pay damages would result in similar litigation targeting Americans abroad. During that same period, the administration was seeking to improve relations with President Mohammed Khatami, who was widely perceived as an Iranian "reformer." On Oct. 21, 1998, President Clinton issued Presidential Determination 99-1, a "national security waiver" which effectively blocked the Flatow family from attaching what had been Iranian consular and diplomatic property in Washington. Noting that the administrations of George W. Bush, Bill Clinton and Barack Obama have all opposed the efforts of terror-victim families to collect money from terrorists and governments that support them, Flatow says the September 11 families need to understand they have a long fight ahead of them. They need to reach out .to other families in similar situations. "When you have a crown prince in Saudi Arabia laughing up his sleeve because the U.S. government supports them," Flatow told IPT News, "it's a twisted, twisted thing." Two years ago I co-wrote a fairly extensive law review documenting the inculcation of hatred towards the west by the Kingdom of Saudi Arabia and suggesting legal means to hold the Kingdom liable for the consequences of their propogation of a hateful religious ideology. It is published at 60 Okla. L. Review 223 (2007) and its principal contribution is that it goes to the heart of the issue of Wahhabist terrorism. It is not just about financing terrorist groups, but is a more fundamental responsibility for creating and imposing a form of Islam that leads directly to terrorist acts. It was no statistical fluke that 15 of the 9/11 jihadists were Saudi subjects. For our government to shield Saudi Arabia from responsiblility for its actions denies not only compensation to the victims, but it forecloses an opportunity to create a sterling judicial record of how Saudi Arabia has inspired nothing short of a crime against humanity. It was Washington's foolish state craft that sent us into a useless war against the secular regime Saddam Hussain while ignoring the real threat from the princes and mulahs of Saudi Arabia. It is the ideology, not just the money, that sustains Islamic terrorism.